I'm sure you didn't stop by to have me bore you with tales about me. Sufficed to say I have an appreciation of nature and the world around me. I also happen to enjoy photography. Putting the two together to actually capture what I see is a genuine pleasure. Speaking of nature, has anyone noticed how much garbage one can find two miles back in the woods? How about the amount of graffiti and beer cans that can be found in close proximity to some of the most scenic spots in your area? Even at local parks where you might expect that people would at least use the trash containers provided, there's trash scattered everywhere. It isn't just teen agers showing no respect, there are supposedly adult, mature individuals who think nothing of loading their trash into the truck and just dropping it off at the first place no one is in sight. The image at the right is an example of just that disrespect for nature. 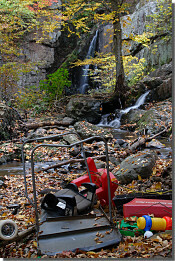 The falls in question are conveniently located just off a small road with easy access to the cliffs. Obviously a great place to unload all those used up items quickly and without being seen! I just don't understand how some people can have such complete disregard for their world. My first digital SLR was the Canon Digital Rebel which served honorably for many years. After a stint in Scotland with my son it returned only to be "traded in" for my latest acquisition, a Canon 7D. The 7D is my primary camera but my trusty 40D continues to ride shotgun. Having a couple of setups ready comes in useful when you only have a second or two to capture the moment. Current lenses include the 17-40 f/4L, 100 f/2.8 macro, 200 f/2.8L, 70-200 f/4L and the 400 f/5.6L.